To characterize the landscape of personal learning among adult Americans, the October-November 2015 survey presented respondents a list of possible learning activities they might pursue. For personal learning, most adults turn to how-to magazines, consumer magazines or other publications to learn something on a topic of personal interest – and this outpaces signing up for an online course by a 58% to 16% margin. The nearby chart shows the range of personal learning activities that we queried in this survey. 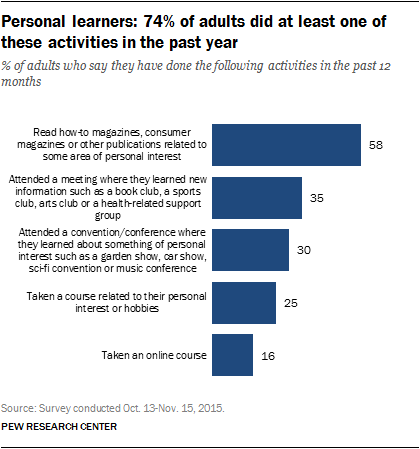 Overall, 74% of adults have done at least one of the five personal learning activities considered. For the most part, adults are motivated to pursue this learning because they have extra time or a desire to make their lives more full. Among personal learners, 80% do this to make their lives more interesting or full and 60% do this because they have extra time on their hands. Additionally, 64% are motivated to pursue learning in order to help others more effectively. Another third (36%) say turning a hobby into something that generates income was a motive and a similar number (33%) say they engaged in such learning to keep up with the activities of their kids, grandchildren or others in their life. When asked where they have taken courses or pursued personal learning, the internet leads the way. Still, place matters a great deal for personal learning, even as the internet plays a role for many learners in getting more out of location-based experiences. Overall, 81% of personal learners say that one of the five types of locations we listed in the survey was a site where they pursued their learning. It is also the case that a minority of personal learners rely heavily on the internet for learning: one-third (31%) say that most or all of their learning took place online. Wherever people learn or whatever their motivation, one thing is clear: Learners report positive impacts from their personal educational pursuits. Nearly nine-in-ten (87%) say their personal learning has helped them feel more capable, but strong majorities express satisfaction in other areas, too. These uniformly positive perspectives on the impact of personal learning are more prominent for minorities and lower-income Americans. African Americans and Hispanics who are personal learners are more likely than white Americans to say personal learning opens up new perspectives in their lives: 80% of African Americans and 77% of Hispanics say this, while 65% of whites do. The figures are similar for making new friends, with 78% of Hispanics and 75% of blacks saying that adult learning helps them make new friends, compared with 60% of whites. These groups are also more likely than whites to say personal learning makes them feel more connected to their community: 65% of Hispanics and 64% of African Americans say this, while 55% of whites do. With respect to income, 75% of personal learners in homes with annual household incomes less than $30,000 say personal learning has opened up new perspectives in their lives, 70% say it has helped them make new friends and 65% say it has made them feel more connected to their community. For higher income Americans (those whose annual household incomes are $75,000 or more), 68% say personal learning has opened up new perspectives in their lives, 63% say it has helped them make new friends and 54% say it has made them feel more connected to their community.